Suspected Taliban militants have beheaded a headmaster in a central Afghan town, the latest in a string of attacks on teachers and schools in the volatile region, officials said Wednesday. The decapitated body of Malim Abdul Habib was found in his home in Qalat town on Wednesday, said Ali Khail, a local government spokesman. Assailants were believed to have killed him late Tuesday in front of his family after breaking into the house, he said. Habib was the headmaster of Shaikh Mathi Baba high school, which is attended by some 1,300 boys and girls. Zabul province's education director Nabi Khushal blamed the Taliban for the killing. "Only the Taliban are against girls being educated," he said. 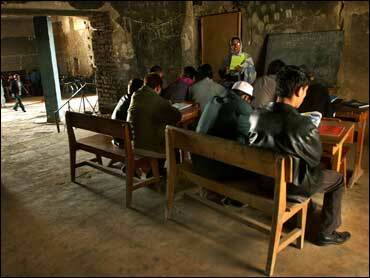 "The Taliban often attack our teachers and beat them. But this is the first time one has been killed in this province." The insurgents in the past year have occasionally put up posters around Qalat demanding girls' schools be closed and threatening to kill teachers, Khushal said. He said 100 of the province's 170 registered schools have been closed in the past two to three years, mostly in outlying districts, because of poor security. Of the 35,000 students attending schools in Zabul, only 2,700 were girls, he said. There has been a spate of attacks on girls' schools and teachers across Afghanistan since U.S.-led forces ousted the Taliban in 2001. In October, gunmen shot dead a headmaster in front of his students at his boys' school in southern Kandahar province. A spokesman for UNICEF, the U.N.'s children agency, said the attacks were "incredibly worrying." "We have seen a change in the nature of attacks in the past couple of months with these killings," said Edward Carwardine. "We hope these incidents will not deter families from sending their children to school." The former Taliban regime prohibited girls from attending school as part of its widely criticized drive to establish what it considered a "pure" Islamic state. Hundreds of thousands of girls have returned to school since the Taliban's ouster, but opposition remains in conservative areas of rural Afghanistan. The Taliban in the past year have stepped up attacks against government targets, particularly in the south and east, triggering the deadliest fighting with joint Afghan government-U.S. coalition forces since the hard-line movement was ousted.